I finally sat down with my copy of The Mark last night. It's unfortunately slow going, because I have a deadline in two weeks, but so far I love it! 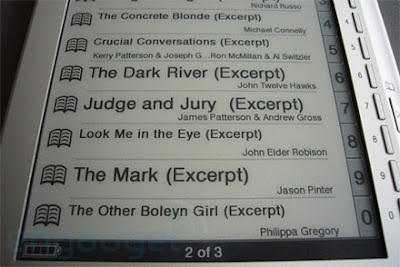 I love that Sony Reader! My only problem is that I think (I'm pretty sure?) you have to buy the books from them. Is that right? If I buy an ebook elsewhere it won't convert? Same with pdf ebooks? Rachel, I hear you, I'm on deadline as well. I love the current book I'm reading, but if I get 10 pages of pleasure reading a night that's optimistic. Scribbler, thanks a ton. I haven't actually used an e-reader--something about holding an actual book just feels right--but I might give it a whirl sometime soon.